This patient was followed for pars planitis in both eyes. Despite treatment with mycophenolate mofetil, she had persistent inflammation and worsening cystoid macular edema. As a temporizing measure in anticipation of cryotherapy treatment, dexamethasone intravitreal implant (Ozurdex®) was placed in the right eye. 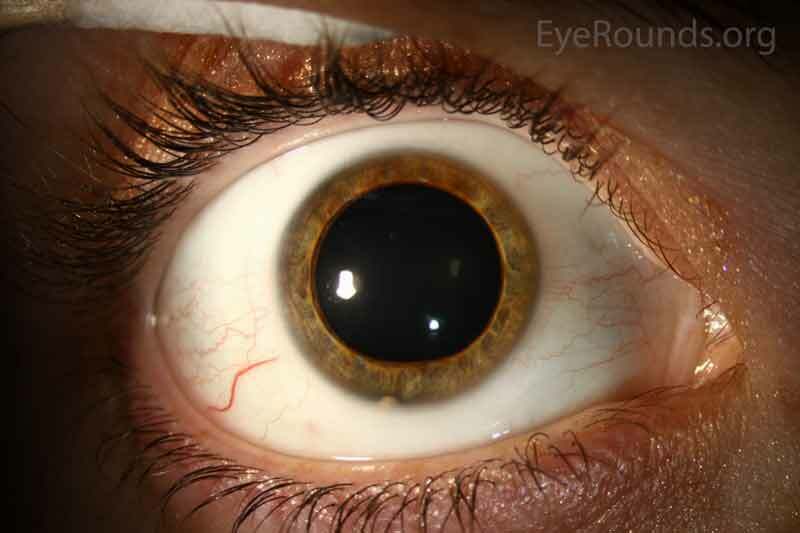 Following implantation, she developed a hyphema, and her iris was peaked inferiorly. 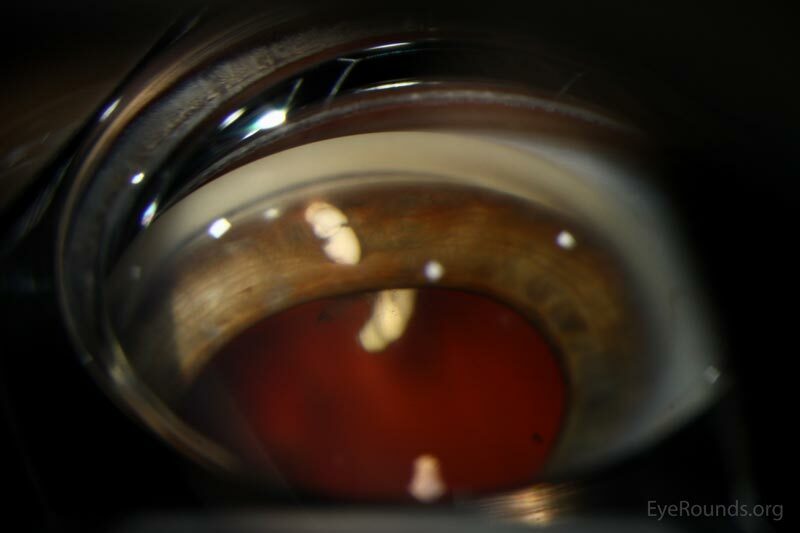 Once the hyphema resolved, the Ozurdex was found lodged through the inferior iris. 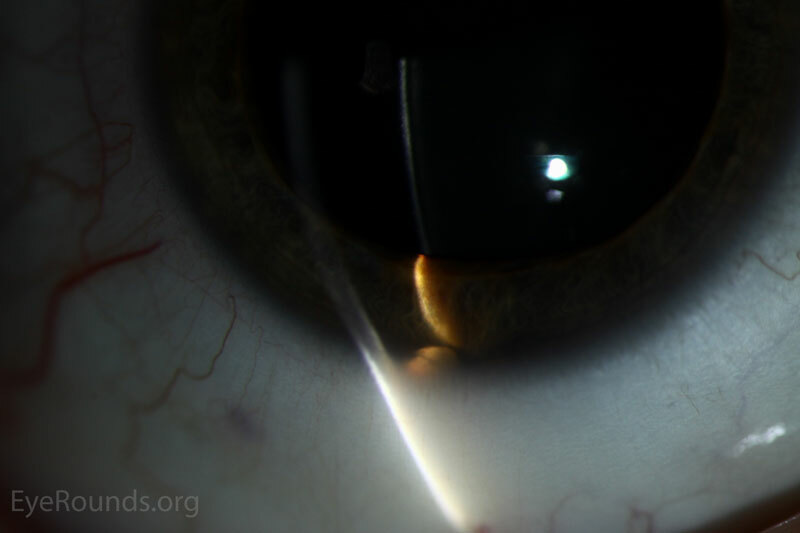 Fortunately, vision and intraocular pressure remained stable, and there was no corneal touch or evidence of corneal decompensation. Her pars planitis responded well to the Ozurdex implant despite its malposition, and she was later treated definitively with cryotherapy to both eyes. The images below show a peaked pupil inferiorly with the dexamethasone implant in a transiridal position. This case emphasizes the necessity of appropriate training and early supervision in placement of these implants.